Baby monitors have come a loooong way since we were littlies ourselves. No more do parents have to listen intently to the muffled sounds of their offspring tossing and turning in their cot; these days we can watch them with multiple tiltable cameras on colour screens – and thanks to Uniden’s latest innovation, we can now use a dedicated app that gives us remote access from our smartphone. So clever! With over 50 years of global excellence, Uniden has a range of gold award-winning baby monitors available, including their latest digital baby monitor, the BW3451R Series. 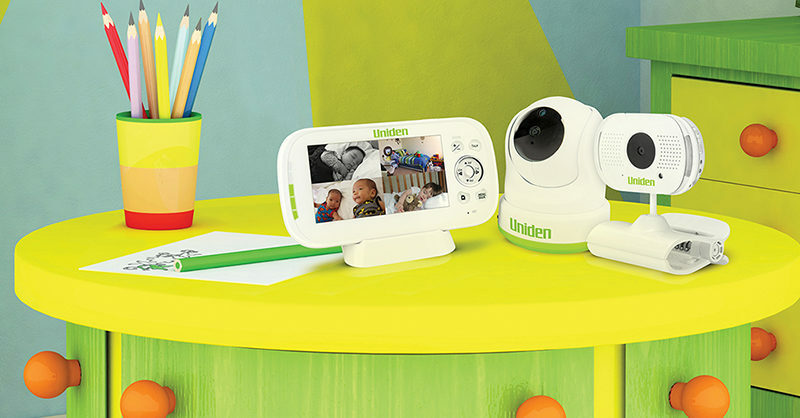 Uniden’s new wireless solution is designed to monitor the safety of your baby or kids while playing. Exceptionally user-friendly and with a high quality digital encrypted monitoring system, the BW3451R Series lets you manoeuvre and take control of the whereabouts of your child! Uniden’s BW3451R Series baby monitor is jam packed full of advanced technological features, but is still ridiculously easy to use and set up, making it the most practical and informative baby monitor yet. And here’s the best bit. The BW3451R Series baby monitor can be controlled remotely by the Baby Watch app that’s free to download to your smartphone or tablet device. Parents can zoom, pan and tilt the camera to focus in on their baby while they are at work or out to dinner and the babysitter will be none-the-wiser. Parents can even say goodnight using the app via their smartphone.